On the other hand, Mankind is passing through a humanistic phase based on a thirst for knowledge, one in which he seeks to develop his essential qualities at any cost. We would all like to be Leonardo da Vinci. This new Renaissance, combined with a desire to be different, leads us to stroll through history in a dignified manner and create new formulae, like good alchemists, supported at all times by the latest technological advances. The result of our research has led to four movements, based on our use of the past and the present and on our use of tradition and modernity. Here we come across objects that have a certain aura. We look back on what we know, on a form of know-how that has faded. Nostalgia and intellectual appeal play a leading role in all areas. A sober and enigmatic appearance, similar to romanticism, flees from a sense of the superficial and synthesizes what is essential. Harmony and sobriety with regard to shapes and materials. At times, reality blends with fiction, deconstructing thoughts and ideas. Empty and misty shades. Discreet half-shades and austere natural colours create an elegant and enigmatic colour effect, one that borders on non-colour. Coarse-grain, rustic types of leather, crocodile and matt snakeskin, metallic salmon, washed leather with a used appearance, embossed nobuck, natural wrinkles. Waxed surfaces, scuffed and worn effects. Artificially rough textiles, ornamental pendants, canvas and thick felt. Old paper prints with re-dimensioned motifs. Fine geometric designs, embroidery and combinations of silk with wool. Buttons, sophisticated zips and coloured hooks and eyes. Small satin flounces, cameos adorned with pearls or precious stones. 1940's details such as bows, laces and used ribbons as complements. Corset-inspired ties. Square buckles, sumptuous adornments, symbols and fetishes. Brooches made of shell, bone and worked metal. Nostalgic and melancholy ambiences. Elegant and austere models with a mysterious and intellectual air that appear to have been found inside a wardrobe belonging to Agatha Christie, Charles Dickens or Queen Victoria. Designs inspired by the styles that caused a furore in the 19th century: bootees, ankle boots, gaiters, pumps, Wellington boots ... but with a more sober and functional up-to-date outlook. For ladies, the shapes will feature rounded or wide, semi-square toes, jutting out somewhat. The heels will be straight and thick in a masculine style, or low reel-type or banana heels, covered with rubber or leather. For men, the shapes will be oval or thick duck's beak designs, jutting out a fair bit. Thick heels. Leather soles will combine with rubber for the more sporty models, where we will also find sewn details. The rims will be wide and smooth. This trend seeks to establish a sense of balance, well-being and happiness of body and mind. Union of the affected and the authentic. A sumptuous journey that unites the luxury of other eras: Byzantium, Mongolia, rich markets, the mad 20's, the explorations of Marco Polo. This is combined with a renewed spirit of ethnic opulence. Elegance and luxury, but featuring ethnic and mystic echoes. This constitutes a form of rustic folk elegance. We find a considerable wealth of colours, one that brings together shades such as saffron, yellow and ochre, with the bright appeal of gold and the opulence of purple and violet. Magic reigns supreme with long-haired or cropped fur, smooth, crimped or embossed, stripped, gilded and polished, velvety with brocade and damask effects, Byzantine decoration, fringed, quilted and damask-like materials. The astrakhan effect appears in all forms. Wool, fabrics and strongly decorated fur, featuring highly elaborate embroidery. Passementerie using fabric or embroidered or embossed leather, replete with tassels, pompoms and festoons. Ethnic details in metal, square buckles, draped effects, decoration featuring rounded stones and pearls. Straps, handles and buckles made of beads and worked metal or metal repoussé. Old tacks and a large variety of rivets, large stones, hammered metal and strips of fur. Elegant, sumptuous and opulent designs with ethnic and folk touches. Authentic luxury inspired by the exotic appeal of trips on the Orient Express or the Trans-Siberian. 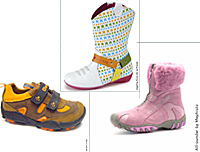 Booties and ankle-boots abound in this trend, recalling those used by the peoples of remote countries, although in somewhat more sophisticated versions. There is also room for T-bar models that are reminiscent of the 1920's and an Art Nouveau style. For women, shapes with slender, semi-square toes that jut out in order to lend them an Oriental style. For men, oval toes or toes that are almond-shaped with lengthened vamps. Soles of whimsical shape, made of leather and of the Billy type. Thick straight heels or reel-type heels, lined with rubber, leather or passementerie. Highly elaborate heels of Byzantine inspiration. 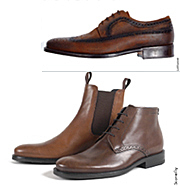 The soles for men are sober and classic, but featuring a sporty touch, combining leather, crêpe and rubber. A review of avant-garde designs in the laboratory of modernity, codifying the individual within the urban and technological world that makes up his environment. These codes are as uniform as words, as phrases, as texts, as a context and pretext for fashion. The radical must be imbued with a modern spirit, blending colours, materials, nostalgic references, ideas, even antagonistic feelings in order to codify products and endow them with meaning, without masking either their modern appeal or their retro influence. SIGNALS - BASIC - IMAGINATION - DREAMY - FUNCTIONAL - CONNECTION - SIGNS - CONSTRUCTION - COLLECTIVE APPEAL. Ultra-colour is combined with non-colour. Antagonistic relationship between acidic and vibrant tones and powdery neutral shades. This trend abuses fluid and light structures, both organic and inorganic. The type of leather is extra-smooth or wrinkled, glazed, matt or polished. Nobuck, wrinkled imitation leather, double-face. Under the heading of textiles we will find neoprene, nylon and re-mastered jacquards. Classic fabrics, Modernist, pre-Cubist geometric and numerical graphic designs, etc. A combination of relief and smooth materials. Cutting-edge lines based on a strong urban style featuring sporty and technological influences. Basic and functional models that are also imaginative. 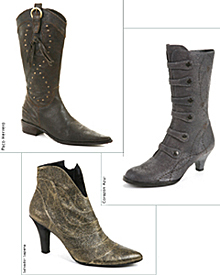 A predominance of dress shoes, ankle boots and high boots for women. For men and children, reworked classics and sporty models. This trend is also inspired by uniforms and the aesthetic appeal of airline companies. Square and almond-shaped toes with marked profiles for women. Thick square toes and sporty-style toes for men. Square-shaped soles with edges and rounded corners. Pre-fabricated and injected soles which, in some cases, envelop the heels and toes. Cylindrical and square heels of narrow profiles in metal and rubber. Lined wedges and semi-wedges. Thin, indented rubber soles and lined platforms. Witchcraft, incantation and shamanism are employed to create a sumptuous and entertaining image, creating a wave of unrestrained fantasy, ploughing a course between two extremes and offering a new aesthetic message. The theme ranges from convention to irreverence, based on a subversive classic spirit and excessive decoration. In short, "kitsch" is employed alongside the most "chic" appeal. A spectrum of classic Victorian colours, sometimes including noble shades. Saturated tones; audacious and lively shades of fruits and precious stones. A large number of rich materials. 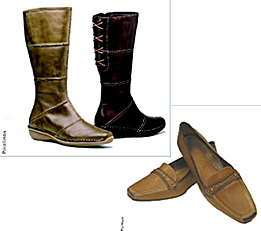 Leather with granulated or glossy finish, ranging from colt to cropped fur. An abundance of highly worked textiles, furniture shop prints, highly elaborate collages, a variety of checks with superimposed floral motifs. Tweed, thick satin and classic finishes. Gelatinous + brilliant. Haute joaillerie in gold, silver and bronze for shoes, boots and ankle boots. Felt adornments, flowers and bows. Worked or re-decorated straps and strips, festoons, frayed edges on the instep, pompoms and woollen braids. Lined tweed buttons. Precious stones on fine fur. A constant do-it-yourself approach under the heading of adornments. Humorous use of folklore items. Brooch-mania. Classic designs renewed through the use of colour, texture and adornments, which acquire a leading role. Conventional approaches are shunned, creating models impregnated with a "British" spirit that is both extravagant and ironic. Bluchers, Oxfords, T-Bars, Ballet-style Shoes, ... all transformed into designs imbued with unrestrained and humorous appeal. Here, the phrase "less is more" is substituted with "more, always more". For women, shapes featuring square toes or thick rounded toes with short vamps. For men, oval or thick semi-square toes. Straight or slightly thick platforms and heels, decorated and lined with leather. Leather soles with protected edges. Smooth narrow rims or featuring fine royal marking. Leather soles dyed unusual colours (aubergine, Russian blue and gall green), featuring long box heels and wide rims for men.